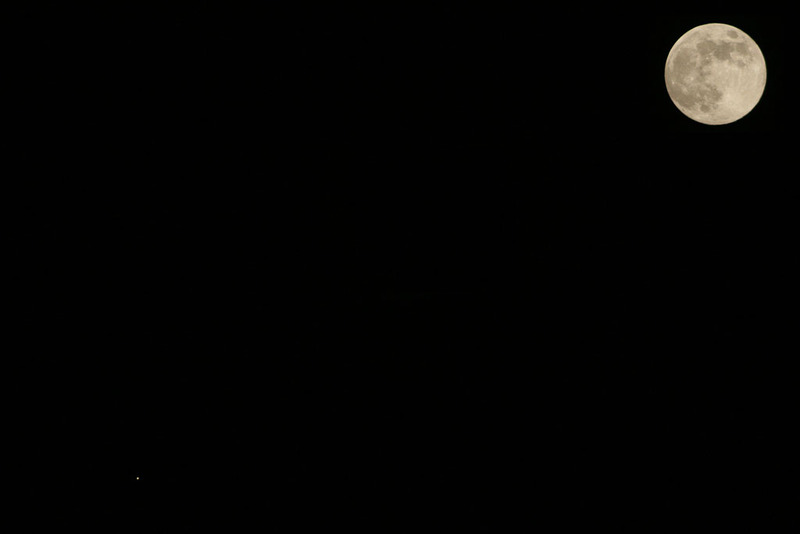 Here is an image of the full Moon and Mars taken on the evening of the 23rd December 2007 by Simon and David Allcock. Equipment used was a Canon 400D, EF 90-300mm Zoom Lens, piggybacked on a Meade LX90. 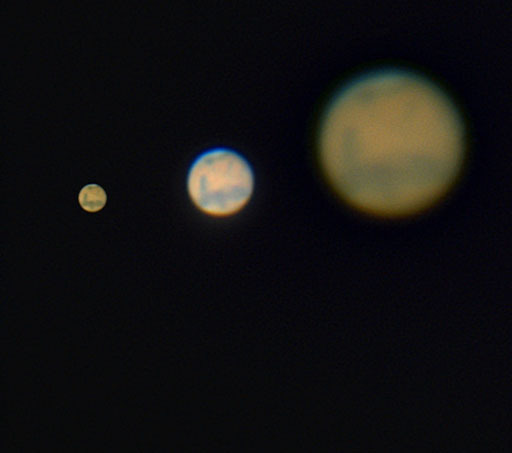 One image was taken at 1/4 second, f/5.6 and 400 ASA, to expose Mars. The other image was taken at 1/4000 second, f/5.6 and 400 ASA to expose the Moon. Both images were converted to TIFF format and then combined in Photoshop and converted to JPEG. Malcolm Neal also captured the following image of Mars and the Moon on the 23rd December 2007. It is actually two merged images as either the Moon was over exposed or Mars was practically invisible if the picture was taken as one exposure. Malcolm tried to get the distance between the two bodies correct but he thinks it may be a little small. The Mars image was a 1/50th second exposure at f/5.6 and 400 ASA. The Moon image was 1/1000th second at the same settings. Both exposures used a 300 mm telephoto lens which using a digital Eos 400 was really a 450mm focal length. 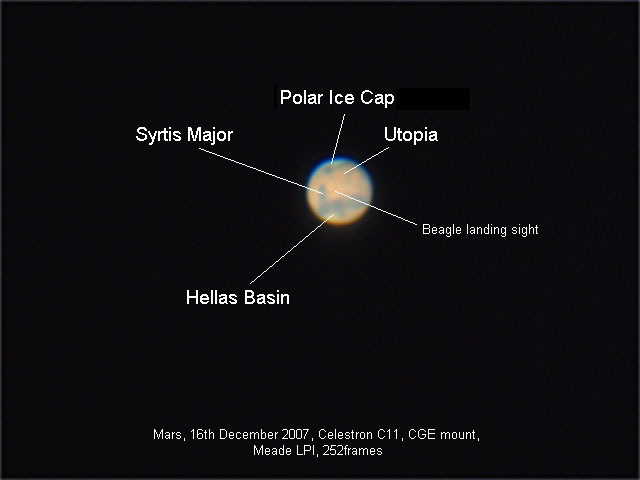 Here are two images of Mars captured on the 16th December 2007 by Chris Newsome using Adrian Brown's Celestron C11 on a CGE mount and a Meade LPI camera. The annotated one is a combination of 252 frames (using a single Barlow lens) stacked and wavelet processed in Registax v4 and then processed in CS2. 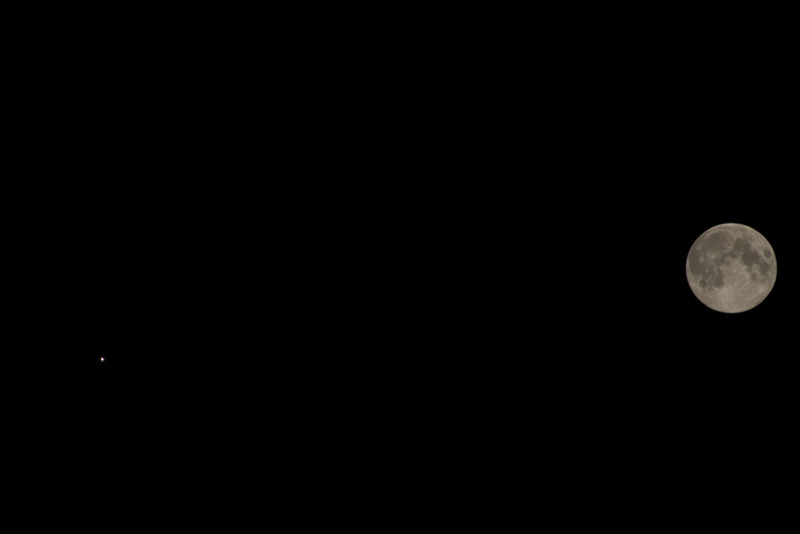 The other image shows the planet (from left to right) without a Barlow, with one Barlow and with two Barlows. The transparency of the sky was good, although it was very unsteady and it was difficult to get a sharp focus on the planet. In total 1.5 GB of images were taken and only the best ones were selected for stacking and processing. 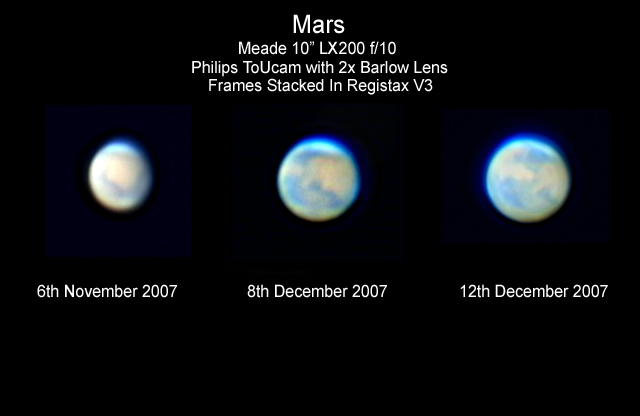 Barry Ashforth captured these images of Mars between November and December 2007.